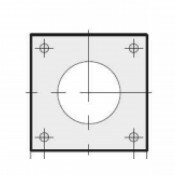 Street Lighting Columns for LED street lights from 3m - 12m. 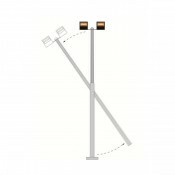 Range of Lamp Posts & accessories for mounting LED street lights. Galvanised Steel Poles for fixing LED Street Lights. 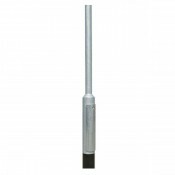 Lighting Column 3m - Steel Galvanised Tubular Street Lamp Post (76mm Shaft / 140mm Base) - 0.8m Roo.. Lighting Column 4m - Steel Galvanised Tubular Street Lamp Post (76mm Shaft / 140mm Base) - 0.8m Roo.. Lighting Column 5m - Steel Galvanised Tubular Street Lamp Post (76mm Shaft / 140mm Base) - 0.8m Roo.. Lighting Column 6m - Steel Galvanised Tubular Street Lamp Post (76mm Shaft / 140mm Base) - 1.0m Roo.. Lighting Column 8m - Steel Galvanised Tubular Street Lamp Post (89mm Shaft / 168mm Base) - 1.2m Roo.. 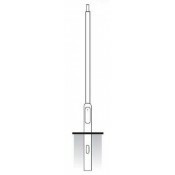 Lighting Column 10m - Steel Galvanised Tubular Street Lamp Post (114mm Shaft / 168mm Base) - 1.5m R.. Lighting Column 12m Heavy Duty Steel Galvanised Tubular Street Lamp Post (168mm Shaft / 192mm Base)..
Flange Plated Lighting Column 3m - Steel Galvanised Tubular Street Lamp Post (76mm Shaft / 140mm Ba..
Flange Plated Lighting Column 4m - Steel Galvanised Tubular Street Lamp Post (76mm Shaft / 140mm Ba..
Flange Plated Lighting Column 5m - Steel Galvanised Tubular Street Lamp Post (76mm Shaft / 140mm Ba..
Flange Plated Lighting Column 6m - Steel Galvanised Tubular Street Lamp Post (76mm Shaft / 140mm Ba..
Flange Plated Lighting Column 8m - Steel Galvanised Tubular Street Lamp Post (89mm Shaft / 168mm Ba..
Mid-Hinged Lighting Column 4m - Steel Galvanised Tubular Street Lamp Post (76mm Shaft / 140mm Base)..
Mid-Hinged Lighting Column 5m - Steel Galvanised Tubular Street Lamp Post (76mm Shaft / 140mm Base)..
6m Mid-Hinged Lighting Column - Steel Galvanised Tubular Street Lamp Post (76mm Shaft / 140mm Base) ..
Mid-Hinged Lighting Column 8m - Steel Galvanised Tubular Street Lamp Post (89mm Shaft / 168mm Base)..
Base-Hinged Lighting Column 4m - Steel Galvanised Tubular Street Lamp Post (76mm Shaft / 140mm Base..
Base-Hinged Lighting Column 5m - Steel Galvanised Tubular Street Lamp Post (76mm Shaft / 140mm Base..
Base-Hinged Lighting Column 6m - Steel Galvanised Tubular Street Lamp Post (76mm Shaft / 140mm Base..
Base-Hinged Lighting Column 8m - Steel Galvanised Tubular Street Lamp Post (89mm Shaft / 168mm Base..